A man walks past an elections poster which reads - "In the moment of truth - Barak"
This past Shabbat, when good friends of ours came over for lunch, we caught up with their daughter, now an officer in the IDF's Education Corps. She's working with the most problematic soldiers - kids without high-school diplomas from broken and impoverished homes, kids with a history of violence, young men for whom the army may be the last chance to fashion a life of some worth. One day, she tells us, she's speaking to them about Zionism, and one of them asks her, "How do you know so much about Zionism? Are you a new immigrant?" We all chuckled at the naivete. What, only a new immigrant (which she's not) can know something about Zionism? That's kind of funny. But the laughter dissipated quickly. For Election Day loomed. And though it wasn't clear who would win (still the case as of this writing, one day before Election Day), one fact had become patently obvious - none of the candidates was saying anything at all about the issues that had led us immigrants to move here. Something else was clear, too. No matter who wins, we've all lost this election. Sixty years post-independence, we've got three major candidates (plus our version of Joseph McCarthy, but more on that in a subsequent column) who are utterly silent about what the Jewish people is trying to build in the last state it will ever have. The candidates all know that Iran must be stopped. They all understand (though not all admit) that land-for-peace won't work, that the two-state solution is all but dead, and that if anything is to change, we'd better start thinking regionally instead of bilaterally. But none has said anything of substance about the economy, the pathetic state of Israeli education, the parasitism of those who live here without serving the state or, perhaps most importantly, the country's Jewish character. The closest they've come to any utterance about what should be Jewish about the Jewish state is their insistence that they won't refuse to include McCarthy - oops, I mean Avigdor Lieberman - in a coalition. 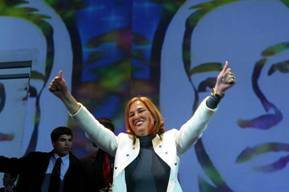 Israeli Foreign Minister and Kadima party leader Tzipi Livni waves to supporters during a rally in Tel Aviv Tuesday, Feb 17, 2009. When that's the nature of the discourse, it doesn't really matter who wins. We've all lost, and we could be on the verge of losing a lot more. All this has me thinking about that soldier who believes that Zionism is the purview of immigrants. Maybe he wasn't so foolish after all. Perhaps his innocent question ought to serve as a reminder to those of us who immigrated here that we did so because we actually believe in something. Maybe it's time to stop talking about those dreams only around the Shabbat table and to begin to market them in the political arena. Those of us who arrived from the States, at least, come from a country which, despite its myriad challenges, knows how to frame its political discourse in light of a sense of the nation's purpose. In his inaugural speech, Barack Obama reminded his listeners that "America has carried on not simply because of the skill or vision of those in high office, but because we the people have remained faithful to the ideals of our forebears, and true to our founding documents." And then he quoted Thomas Paine. In language that may well have resonated more with us expats watching from afar than it did with some of those listening to him in the Mall, Obama continued: "So let us mark this day with remembrance, of who we are and how far we have traveled." Likud Chairman Benjamin Netanyahu speaks at the Conference of President's of Major American Jewish Organizations in Jerusalem on February 16, 2009. Has any one of our candidates said a single thing about who we are, or why we have traveled this far? They haven't; nor are they likely to. So the duty falls upon us. Those of us who know why we're here - be we Americans, Brits, French, Argentineans or others - and who remind ourselves and our children of how far we have traveled and why, must view our immigrant status not as a burden to be hidden until a younger, accent-free generation arises to take our place, but rather as a bounty to share with a country that no longer produces leaders who know why their forebears traveled. It is one of the unexplained peculiarities of Israeli politics that while Russian immigrants have produced an ample share of political candidates (Natan Sharansky and Lieberman being opposite ends of a host of spectra), the thousands of Americans now living here have yielded almost none. 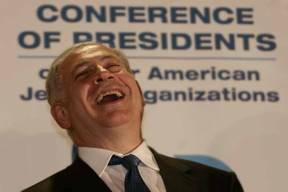 (Golda Meir no longer counts.) Is that because we imagine we can better contribute to the state in other ways? 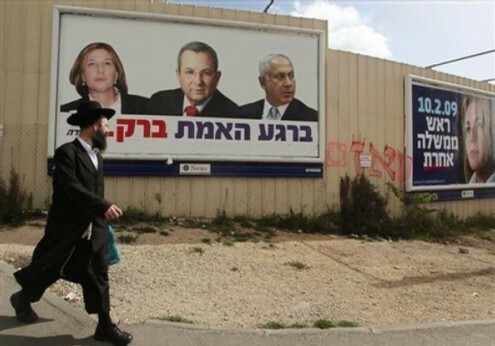 Or is it because the ugly, hostile nature of Israeli politics seems too daunting for our Protestant dispositions? Whatever the reason, now may be the time to rethink that reticence and to roll up our communal sleeves. No one else is speaking about "who we are and how far we've traveled." But the collective lives of immigrants are about that. Perhaps, precisely because of our personal narratives and the political heritages we've brought with us, staying out of the fray is a right we no longer have. Years ago, when I was working for a large American foundation in Jerusalem, one of the Israelis on staff said to me, "The problem with all of you is that you come here thinking you're going to show the natives how to do it." I recall feeling embarrassed and stammering that no, of course we didn't think that that's what we were doing. 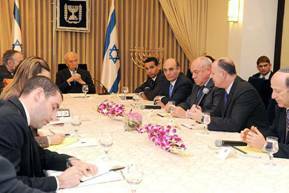 President Shimon Peres (L) meeting with members of the Likud party in Jerusalem on February 18, 2009. Peres began consulting political leaders to decide who to task with trying to form a new government after the country's nail-biting general election on February 18. But he was right, and I was lying - to him and to myself. This is still a country in formation, and as in generations past, its future depends in no small measure on what its immigrants can contribute. We ought not be embarrassed by the fact that there are things we know and believe, precisely because we've come from a different place. Given what the "natives" can't say and what some "non-natives" from nondemocratic countries are saying, our right to observe quietly from the sidelines has now expired. Daniel Gordis is Senior Vice President of the Shalem Center in Jerusalem. He is the author, most recently, of Coming Together, Coming Apart: A Memoir of Heartbreak and Promise in Israel (John Wiley & Sons, 2006). His next book, Saving Israel: How the Jewish People Can Win a War That May Never End, will be published next month. This article first appeared in The Jerusalem Post on February 12, 2009.